When hanging picture frames, you no longer need to use tools, screws or nails! 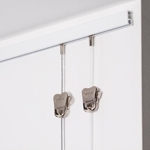 With the various picture rail systems manufactured by STAS you can hang your pictures fast, easy and flexibly. Our picture hanging systems are being used by the most prestigious museums and galleries worldwide. 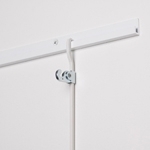 The picture hanging systems consist of a rail, which can be mounted on the wall or ceiling. 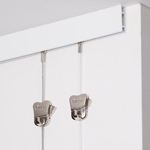 With the matching hooks and cords you can hang your picture frames perfectly. 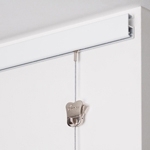 For most picture frames the STAS minirail, cliprail, cliprail max, j-rail and u-rail hanging systems will do. 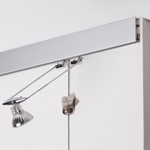 Use the STAS j-rail max (carries loads up to 100 kg/m¹ = 220 lbs) to hang very heavy works of art. It’s simple and massively strong. This explains why this system is extensively used in galleries and museums all over the world. An additional anti-theft system is also available. We’re also specialized in art lighting. With a picture hanging system like the STAS multirail, you can light your pictures directly from the hanging system by placing lighting fixtures straight into the picture rail.